Get into the Christmas spirit this weekend at some of these great events in the area, but don’t forget to bundle up! For even more ideas of things to do, visit our Going Out Guide, and also make sure to check out our blog post on all the great holiday events going on at the National Harbor this month for Christmas on the Potomac! 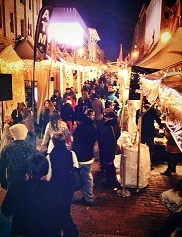 Description: The downtown DC Holiday Market begins this weekend in the Penn Quarter neighborhood in DC and continues through December 23rd. Enjoy a different live performance each day and shop outdoors with over 150 exhibitors and artisans for a multitude of items, including fine arts, crafts, gourmet foods and more! For more information, visit the official website here. Description: Spend some time with the family and enjoy great entertainment this weekend at the National Mall! There will be live music concerts, films, demonstrations, trunk shows, book signings and much more. The museums participating in this event include the African Art Museum, American History Museum, Natural History Museum, Air and Space Museum, American Indian Museum, and the Freer and Sackler Galleries. This event continues through December 7th, for more information, make sure to visit the Smithsonian website. 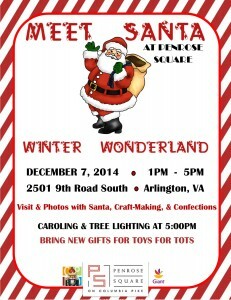 Description: Bring the kids out this weekend for the first annual Winter Wonderland event at Penrose Square in Arlington. Decorate and ornament, enjoy hot chocolate and cookies, collect goodie bags from retailers along Columbia Pike and visit with Santa while getting a photo taken with him! For more information, make sure you visit the official website here.